It would surely be a mistake to think of anything Mark E. Smith's ever done as "cheery," but upon listening to The Wonderful and Frightening World of the Fall, the seventh full-length studio recording from this most iconoclastic and long-lasting of British punk/post-punk/post-post-punk/anti-rock/barbed dance pop bands, I can't help it: even though Smith is in vintage fettle here, rant-singing in his inimitable way about horrible bandwagon-jumping trendies, decapitation at theme parks, and clouting people about the skull with blocks of wood, never before had his rampant, unrepentant cynicism sounded so... good-natured. One could chalk it up in part to circumstance: after spending the better part of a decade languishing on a variety of tiny English labels and just coming off a brief, awkward reconciliation with one (Rough Trade) they had previously kissed off in song ("Leave the Capitol"), the Fall found themselves signed to Beggars Banquet, one of the better UK indies of the time and the venue from which some of their most (relatively) accessible and (ditto) popular music would emanate for the remainder of the 1980's. Thus was the respect the Fall had long received in critical and cultist circles finally matched in financial/distribution terms. But the more likely source of the bright pop-like reorientation that comprises The Wonderful and Frightening World... was a surprising and seemingly unlikely one: domestic bliss. Yes, even though Mark's guitar-wielding American nymphet bride, Brix, had made her tentative debut on 1983's transitional (if typically brilliant) Perverted by Language, it's this record where her influence (a point of constant contention among Fall acolytes ever since) takes hold. Many of the songs on the album are far tighter, smoother, and conventionally-structured than before, with Brix' talent for hooky riffs dovetailing beautifully with Craig Scanlon's trademark scratch-scrabble clangor and her California-grrrl backing trills providing a wondrous foil for her hubby's dyspeptic mutterings, a spoonful of treacle that helps the brimstone slip smoothly through the ear canal, giving the innate subversion that is the Fall's stock-in-trade access to the brain's pleasure centers as never before. And yet, even with Brix' not-inconsiderable leavening element in place, this remains unmistakably the work of the 400-pound guerrilla of rock that is the Fall. The album starts off famously: a dirgy riff that wouldn't sound out of place on one of the earlier, dodgily-produced album tolls in the middle distance, the band starts in on a repeated chant of "Lay... lay... lay..." and a rather comical dullard voice intones "Armageddon... this beautiful tree... boo-hoo... give up living..." and a couple other, hard-to-transcribe phrases, and then the whole thing is suddenly cut off by a quick drumstick count-off into a full-volumed, high-velocity Country-and-Northern rockabilly explosion, a conspicuous shift from the mid-tempo plods of their last couple of albums. In just over five minutes, the Fall blows whatever cobwebs had started to settle on their sound out of the room and into oblivion. The Fall have reinvented themselves once again. A more-mannered take on the format, "2x4," follows, its skiffledelic skip bolstered by Brix' repeated double-tracked rejoinder "Hit 'em on the head!/ With a two-by-four!" Steven Hanley's undeniable bass hook, and Smith's Sun-Studio-speedfreak slapback vocals. If the first two songs take it to the bridge, "Copped It" jets upwards, with the first of several yowls from "friendly visitor" Gavin Friday, great whining keyboards and the best use of a single chord for vertiginous purposes since the Stooges' "TV Eye." Speaking of whom, the oft-ripped riff from that band's classic "I Wanna Be Your Dog" serves as the basis for "Elves," a rail against Scottish pop bands that somewhere along the line morphs into Middle-Earth paranoia (a Tolkien of Smith's extreme, perhaps). At this point, the CD takes a six-song detour into single and EP tracks, including two of the Fall's poppiest numbers ever, "Oh! Brother" and the jauntily bilious sideswipe at pop-cultural Zeligs, "C.R.E.E.P." ("He is a scum-egg/A horrid, trendy wretch"), and the outstanding suburban-drug-pusher anthem, "Pat-Trip Dispenser," a song that inspired the short-lived "Just Say No to Hawking Fake Speed to Mark E. Smith" movement (which I invented just now and plan to abandon at the end of this sentence). The album proper resumes with "Slang King," which finds Smith exclaiming, apropos of nothing much, "Don't make me a go-between! This is Mr. and Mrs. Smith to whom you are speaking!" and referencing Curly-Whirly chocolate bars in an abortive attempt at extorting product-placement residuals from Cadbury (I'm guessing here). "Bug Day" is a creepy full-band jam, a little like a cleaned-up "Hip Priest" without the intermittent explosions, in which Smith reaches the apex of his surrealist paranoia with an insectile-uprising theme that anticipates the opening scene of David Lynch's BLUE VELVET by a couple of years. The two band-member showcases, "Stephen Song" and "Craigness," are fine toss-offs, especially the latter, which ambles along with a nifty clanging riff from Mr. Scanlon and a half-formed narrative about a "neighbor downstairs with one eye" who "co-habs with a mass of blonde curls" until Smith bursts into an end-of-the-world squeal of "CRAAAIIIGGGG!" and the whole thing collapses in on itself. Finally, we come to one of the best tracks on the album, the disorientedly pretty "Disney's Dream Debased," based on an actual incident witnessed by the Smiths where a woman was decapitated on the Matterhorn at Disneyland and a phalanx of overgrown cartoon mammals descended on the crowd to distract them with desperate anthropomorphisized cheeriness, a truly surreal scenario brilliantly matched by the woozy, acid-comedown dreaminess of the tune. One of the Fall's finest moments (among admittedly heady company). But wait! CD listeners are then treated to the extended version of "No Bulbs," a relentlessly up-tempo yelp about squalid flat-living (and a nice thematic precursor to This Nation's Saving Grace's "My New House"), climaxing in some rousing inter-band interplay that winds the whole endeavor up quite satisfyingly. 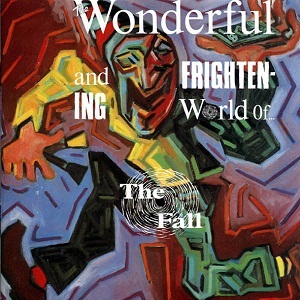 In summation, The Wonderful and Frightening World of the Fall (and its immediate successor, This Nation's Saving Grace) fits in well with albums like Sonic Youth's EVOL, Can's Ege Bamyasi and (you'll forgive the heresy) Pavement's Slanted and Enchanted - an aural snapshot of the moment when a relentlessly experimental band first discovers the joys and uses of more conventional songform, treading (however briefly) on a deliciously exciting middle ground betwixt the two. The Fall have delivered great albums before and since this one (and I am personally of the mind that they've never released a record unworthy of your skekels), but this evocation of the instant when, in Mark E. Smith's words, "the conventional is now experimental," makes this an indispensable purchase for Fall freex and a worthy place to begin for the unindoctrinated. So dig in-ah!